Every once in a while, some company will improve on something that you wouldn’t think needed any improvement at all. Take the grand piano, for instance. 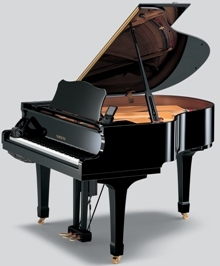 Its sleek blank ebony framework and perfect ivory keys are a symbol of pure music. And yet, Yamaha has made the grand piano even more perfect with the recently unveiled Disklavier Mark IV, a piano that can “play itself, teach you to play, and perform in sync with your favorite CDs”. It is also one of the first pianos to have a Wifi connection with 802.11b specification. As far as I know, the Disklavier is also the only piano with a remote control. This PDA-type pocket remote controller has buttons and a full-color LCD touchscreen, and some models include a tablet-PC remove with 10.4 inch touchscreen. Another feature is its open-ended software-based architecture with Linux Operating System, which is fully upgradeable. The Mark IV’s hard drive is 80 gigabytes, which completely trounces the 16 megabytes of flash memory in the previous models. Other features include some family entertainment features such as karaoke-file compatibility, microphone input and vocal harmony in the piano’s built-in speakers or external sound system. I could probably fill three articles with all the other features. Anyway, these pianos are available in many models for about $11,000 to start.